The three figures of the Goddess have long tresses, a part of which in each case is up in a bun behind the head; they each wear a sleeved Ionic chiton, pinned by a series of shoulder fastenings, and over this in all cases a sleeveless Doric garment which is fastened by a brooch on the right shoulder, which clings to the body and legs in a series of broad, diaphanous folds, and which joins the drapery of the neighbouring figure at the rear where the folds are narrower and vertical. There are many Graeco-Roman variants of such figures, usually in small marble versions and less frequently in bronze sculpture, of this aspect of Artemis or the triple Hecate. In these the costuming and attributes of the figures vary considerably, although as would be expected a torch is not uncommonly held between the linked hands of each and a snake is frequently held with or without this as symbolic of the nether regions. 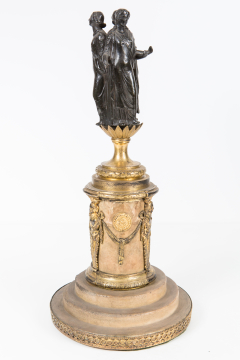 The marble statuettes generally show the figures standing against a central kalathos-like pillar; for technical reasons this is omitted to allow for the hollow casting and perhaps functional purposes of the Soane bronze. Cornelius Vermeule (author of this catalogue entry) studied an excellent example in Greek marble which passed through the auction house of Messrs. Spink and Son, London1 and there is a good parallel in the Cassel Gallery in Germany2. These house-hold-shrine size statuettes have been found in the West as far afield as Trier3 and the Amiens area4. They also exist in wood5. In bronze the best complete group is in the Conservatori, Rome6 - a triple-bodied Hecate which in the attributes shows the influence of later religious syncretism, if we consider that Alkamenes seems to have been the first to create the type of the triple Hecate7. The Fifth Century origins of these figures survive only in the costuming; the torches of the Moon Goddess combined with the snake and dagger of Erinys, and the key and rope of the guardian of the Underworld, all suggested restorations for the lost attributes of the Soane figure, belong to the late Hellenistic or Roman period. 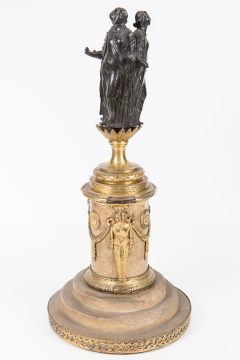 This Hekate may be related, in its retrospective classicism, to the so-called "Angerone", a copy of a lost bronze of the fifth century BC, represented by an example in the Soane Museum. 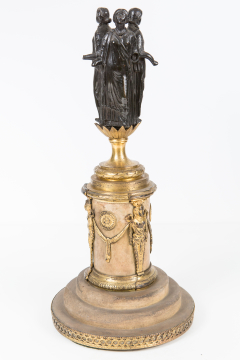 The prototype is related to the Aphrodite with a dove in the Fogg Museum from the Watkins Collection8. 1 1953 A. C. Cooper photograph no.154757. 2 Bieber, Cassel, p. 59, no. 148, pl. XLII; for the types see Petersen, Archäol. epigr. Mitt aus Österreich, IV, 1880, p. 141ff. ; V, 1881, p.1ff. and Sitte, JOAI., XIII, 1910, p. 87ff., pls. III, IV. 3 Cp. Espérandieu, VI, p. 233, no. 4947, Trier Museum. 5 AJA, 44, 1940, p. 293ff. 6 Jones, Cons., p. 285f., no. 1, pl. 114. 8 No. 1960.666; Frederick M.Watkins Collection, Cambridge, Massachusetts, 1973, no.6. 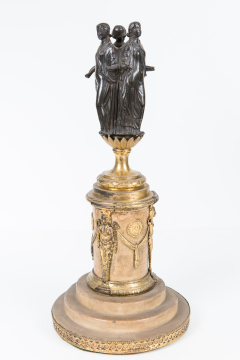 Purchased by John Soane at the Richard Cosway Sale (Mr.Stanley), 22 May1821, Lot. 68,The Triform Diana - on a marble pedestal, £2.10.0. M.B. Comstock/C.C. Vermeule, Greek Etruscan and Roman Bronzes in the Museum of Fine Arts, Boston, Boston 1971, no 104.